Dry air and shear finally took Dorian to the grave. Although Dorian survived cooler water temperatures and a giant drink of dry air over the last couple days, Dorian finally succumbed to the harsh conditions this afternoon. Ex-Dorian is now a remnant low associated with a tropical wave, and the story only gets worse from here. Check out the graphic below for all of the hoops that Ex-Dorian must jump through in order to regenerate. There is some light at the end of the tunnel, or in 3-5 days. 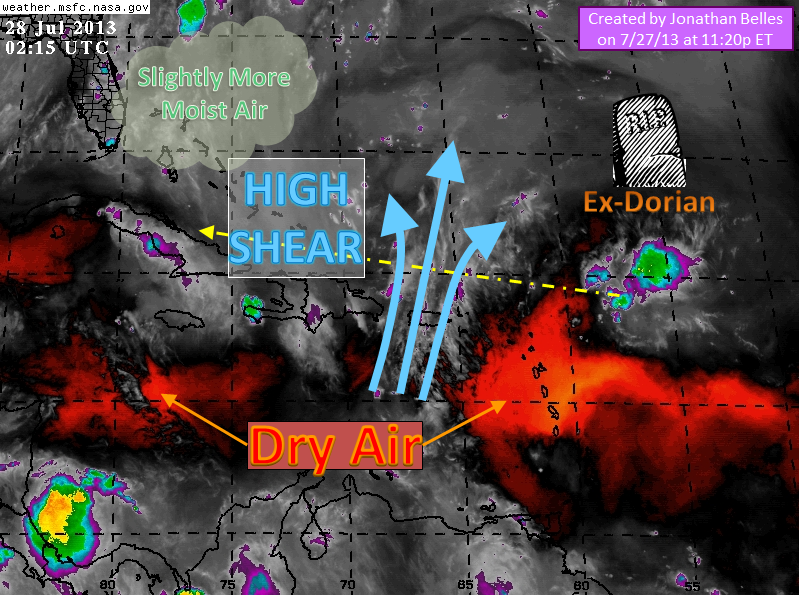 It is expected that the shear will fall just a bit, but the real improvement may come when ex-dorian reaches a bit more humid air. Chances of regeneration are 10%, but may increase in a day or two if the current forecast holds. I’ll keep an eye on that. No regeneration is expected within 36 hours, but the Leeward Islands, Puerto Rico, and the northern shore of Hispaniola should expect waves of 4-7 feet as this wave passes by. Rain chances for the northern shores of Puerto Rico, Hispaniola, and Cuba are likely between 20-30%, but the good news is that all of the shear will take most of the thunderstorm activity out into the Atlantic. We’ll have to watch the Bahamas by Tuesday into Wednesday as rain chances may increase there. A rare activation of the Central Pacific Hurricane Center in Honolulu has occurred in the last 24 hours as Tropical Storm Flossie has passed from the eastern pacific into the central pacific. The last major storm to take aim at Hawaii was none other than the Flossie of 6 years ago, which turned at the last minute, and avoided the Hawaiian islands. The chances are better than Flossie will die before it reaches the Big Island than a turn away from the islands. The last tropical storm that hit the Hawaiian Islands was Hurricane Iniki in 1992, which is well-known as The Storm in Hawaii, and is known as the storm that made cinematic history by changing the course of the original Jurassic Park back in 1992. Iniki brought very heavy rainfall to the island that the final day of filming was taking place, and the last shot was lost due to the hurricane. Many of the rainy scenes in Jurassic Park are due to Iniki. As a couple of the models forecast, an area of low pressure has formed off the coast of the Carolinas and has begun moving northeast up the east coast. This system is rapidly moving toward colder waters, and has a very slim chance of development. Waves will be kicked up along the east coast north of Cape Hatteras, however impacts will be as small as this system’s lifetime. Posted on Saturday, July 27th, 2013, in Tropical Weather. Bookmark the permalink. Leave a comment.